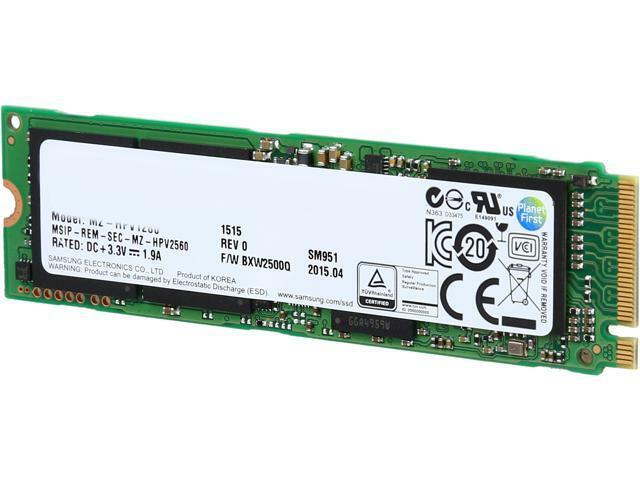 The Samsung SM951 M.2 PCIe SSD (AHCI model) is the new performance leader in M.2 form factor SSD's, providing up to 2150MB/s read and 1500MB/s write sequential data transfer rates. Other Thoughts: I had to look a lot for many tutorials on how to install Windows 10 to this device, as the format of the SSD was incompatible with the version of WIndows supported by the motherboard for my laptop (Asus ROG gl502vt), however, it CAN be done. Cons: OEM SSD so Samsung Magician software will ID it but that is all. If you want to get full use of Samsung Magician software then use only Samsung retail SSD's. Other Thoughts: Works for the intended usage I bought it for. Pros: FAST drive as promised. Other Thoughts: My Alienware 15 r3 laptop did not support booting from AHCI even in legacy boot (Windows 8/10). You can however get windows 7 to boot off of it by installing the boot partition (100MB "System") onto the regular hard drive mapped to the "OS" partition on this SSD. Cons: Small size, but you already know that. Other Thoughts: Buy this for the speed. Pros: fast speeds for reading and writing.. great for installing windows! it took about a hour to install windows and drivers.. a add plus windows takes about 6 to 10 secs to fully boot up..
Other Thoughts: i would recommend buying this if you have a m.2 slot! i would buy this product again and recommend this product to friends and family! Other Thoughts: This M.2 SSD is the "M-Type" with a single notch. Fit perfectly in the motherboard of my new laptop. Works perfectly in Windows 10. Confirm that your motherboard accepts this hardware. is an HDD, used for storing files! Be aware that this M.2 SSD is an OEM version, so there is no paperwork included with the purchased, just plastic packaging with the SSD. Pros: The physical install is cake if your mobo doesn't need anot adapter to make it run with pcie. Getting your pc to register it as a boot drive is only as difficult as the bios or uefi the mobo designer uses. Asus wasn't stupid amounts of difficult, but it does require a couple obscure configurations to go off without a hitch. I used 8.1 as a fresh install just for the free upgrade to 10 and it went off pretty seamlessly seeing as I built it from scratch and loaded the OS about 10 minutes into the build. Cons: It's not a con of the drive, but rather just bios and uefi not having clear directions to not only recognize it as a drive but to boot off of it. Do your research first for that specific model and software version and then consider using this as it would be a major pain to buy this as a primary OS drive and not be able to use it properly. Other Thoughts: The size still boggles the mind. I have yet to see it fall out during heavy input, but I have great airflow in my case and my house is always about 22C so thermal restraints I really haven't seen due to that. The price has come down since I bought it so it's worth a look at if you can support it and don't mind the missing 3 (or 4) x16 slot.